changed again to Glen Alpine Station around 1883.
work like bees after the first approach of the spring flowers. also for advertising. We predict a bright future for glen Alpine Station." 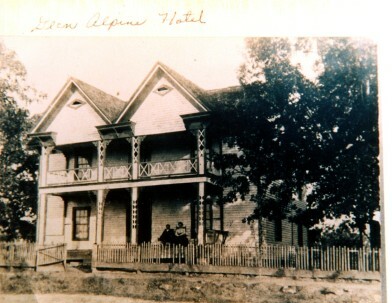 the town received the name Glen Alpine. and especially since it was across the road from the railroad tracks. The main mode of transportation when traveling a far distance in those days. This hotel was closed in the late 1800s. now located, on the west side of the buildings in Glen Alpine.